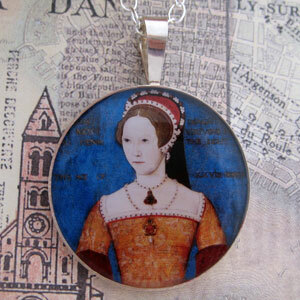 This beautiful, unique and collectible pendant features a portrait of Mary I, as princess, by ‘Master John’ dated to c.1544. Printed with archival inks and materials. The image is protected by a clear, durable and archival resin. Packaged in a lovely eco-friendly 100% recycled gift box. Made in Colorado, USA, by Tiffini, an shipped worldwide.